A restored Victorian gem of a theater still used for staging theatrical and musical shows. The Goodspeed Opera House, a riverside Victorian gem built in 1876 in East Haddam CT (map), has been carefully restored by Goodspeed Musicals to serve as a venue for American musical theater. The setting by the Connecticut River and bridge is so picturesque that it's worth the ride just to see the exterior, but if you have the time, take a tour of the interior. Best of all, see a musical play. The specialty is the revival of early musicals and the production of new works. A number of Goodspeed shows have moved onward and upward to Broadway. Three musicals are offered each season beginning in mid-April and continuing through mid-December with performances every day except Monday and Tuesday, and a matinee on Wednesday. Goodspeed Musicals also operates the Norma Terris Theatre in Chester CT, inaugurated in 1984 to develop new musicals and nurture emerging artists. The 200-seat theater, housed in a former knitting needle factory, was named for actress Norma Terris, star of Jerome Kern's Showboat and a patron and trustee of the Goodspeed Opera House. Rumor has it that Goodspeed Musicals may move from the historic Goodspeed Opera House to a new performance space in Middletown CT soon. For full information on playbills, ticket prices and reservations, see the Goodspeed Musicals website. 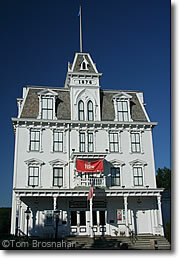 Goodspeed Opera House, a Victorian gem in East Haddam CT.